Large epipelagic fishes (> 30 kg maximum size) are known to display a variety of patterns of vertical movement. Although advances in the affordability and sophistication of electronic tags now allows researchers to routinely document these patterns, there is no standardised approach to classify these behaviours and investigate their physical and biological drivers. This paper reviews the existing knowledge of the vertical movements of large, epipelagic fishes and the evidence for the underlying factors that structure this behaviour. The review focuses on behaviours occurring at a range of temporal scales, from seconds to years. 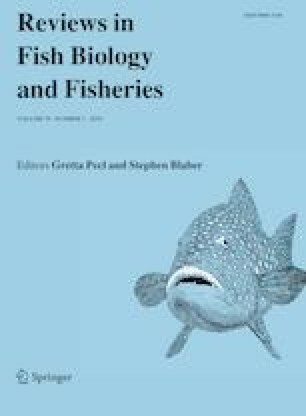 We propose that patterns of vertical movement in gill-breathing animals of the epipelagic are best characterised by the need to move continuously in a three-dimensional environment while optimising food encounter and energy expenditure, avoiding predators, searching for mates and remaining within the limits imposed by the physical environment on their physiology (notably water temperature and oxygen). Modern biologging technologies that record both the internal (body temperature, heart rate) and external physical environment coupled with direct recording of behaviour from tri-axial sensors and animal-borne cameras offer a new approach to the analysis of drivers of vertical movement. Ultimately, this can provide insights into the evolution of the behaviour and morphology of these animals. The online version of this article ( https://doi.org/10.1007/s11160-019-09555-1) contains supplementary material, which is available to authorized users. We thank two anonymous reviewers and Professor Culum Brown for providing constructive comments that improved the manuscript. SA was supported by the Australian Government Research Training Program Scholarship and a UWA Top-Up Scholarship. Further support was provided by the Australian Institute of Marine Science.